Brian Armstrong, CEO of major cryptocurrency exchange Coinbaseand prominent individual in the crypto community, has done a lot to move the cryptocurrency industry forward and is very knowledgable about the space. When he has something to say, people listen. Which is why he recently held a live ask-me-anything (AMA) session where he answered selected questions submitted by the crypto community. The AMA ran for 45 minutes and was filled with interesting questions and keen insights. Armstrong kicked off the AMA with a question of popular demand: what does cryptocurrency need for mass adoption? In response, Armstrong said he believes crypto mass adoption is mostly dependent on 3 things: volatility, scalability, and usability. The problem with Bitcoin (BTC) and most other cryptocurrencies, other than stablecoins, is that they fluctuate drastically against the US dollar. Take Bitcoin, for example. If on a FOMO-fueled impulse you’d bought $100 worth of Bitcoin in December 2018, you would have just $25 now. Traditional investors are not comfortable or used to this heavy volatility, which presents a much greater risk for their investable capital. Armstong stated that if the crypto markets continue to swing drastically, traditional investors will be less inclined to get involved. To combat price volatility, Armstrong suggested that stablecoins can be used as a means of exchange, and that real-world use cases will attract more and more people to crypto, thus reducing its volatility. The second thing Armstrong believes is critical to crypto mass adoption is scalability solutions. He started off by saying there are currently 5 to 10 teams working on viable scalability solutions. He named second-layer solutions like the lightning network and next-gen protocols, which he says will begin to come out over the next 6 to 12 months. These scaling solutions and next-gen protocols will see that cryptocurrencies reach 500-5,000 transactions per second, putting them in competition with the likes of Visa and PayPal level volumes. Once crypto can attain these volume levels, applications with millions of users will be easily supported and mass adoption can occur. As many people are also aware, using cryptocurrency is not nearly as intuitive as it needs to be for mass adoption. Armstrong explained that there are too many steps when it comes to buying, selling, storing, and securing your cryptocurrency. He stated that retail investors need something that works as well as the popular Chinese app, WeChat. Armstrong couldn’t be more right on this point, as previously reported by IIB, 75% of crypto holders still fear the failure of sending transactions while sending crypto. In order for crypto mass adoption to occur, managing your crypto has to be as easy using a common messaging app. Armstrong’s 3 points for crypto mass adoption are being worked on at this very moment. New developments to improve crypto’s scalability, usability, and even volatility are in the works, and Coinbase may be leading the way on this front. For instance, Coinbase is already known to be one of the most user-friendly crypto exchanges available. What’s more, they are now tackling crypto’s usability and volatility problems with the launch of their new Coinbase Visa card which allows users to spend their crypto in-store and online at millions of merchants. Crypto mass adoption may be closer than you think, as the solutions to the crypto mass adoption problems are already being developed and released. Do you think we will begin to see cryptocurrencies being widely adopted among mainstream users this year? Let us know what you think in the comment section below. Can IOTA Break Into The Top 10By 2020? The card app allows users to choose which cryptocurrency wallet they will use to fund their Crypto Card purchases. The blog post added that:. US-based cryptocurrency exchange Coinbase has made its Coinbase Card available to customers in the United Kingdom. The Visa debit card will enable Coinbase users to spend cryptocurrencies effortless in millions of locations around the globe. San Francisco-based cryptocurrency exchange, Coinbase, announced a few hours ago that it had launched its Coinbase Card in the UK. 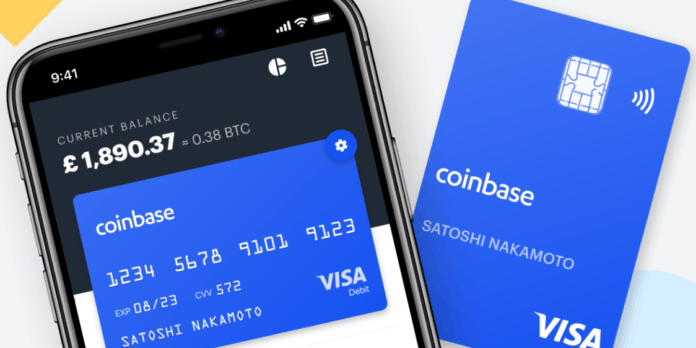 According to the official blog post, the Coinbase Card is a Visa debit card designed to allow customers to spend cryptocurrencies effortlessly in millions of stores and online platforms across the globe. The development team launched the Coinbase Card app to help customers manage their spending. The card app allows users to choose which cryptocurrency wallet they will use to fund their Crypto Card purchases. The Coinbase Card is the first debit card in the UK and EU that is associated with a significant cryptocurrency exchange. While the Coinbase Card is only available to UK customers at the moment, the cryptocurrency exchange expressed its desire to roll out support for other EU countries over the next few months. Coinbase added that it is forfeiting the £4.95 card issuance fee for the first one thousand people to join the waitlist for the card. The Coinbase Card app is available for both iOS and Android smartphones. When a Coinbase account is linked on the mobile app, the crypto balance will be available to users via their virtual and physical cards. The Coinbase community is excited by this latest development as they believe it will help with the adoption of the cryptocurrencies. Meanwhile, EU users are anticipating the availability of the Coinbase Card service in a few months. On April 8, Coinbaseannounced that trading of EOS, REP (Augur’s native coin), and MKR (MakerDao) would be supported on Coinbase Pro, its professional trading platform. The tokens were made available in all jurisdictions with the exception of New York State. Coinbase revealed that EOS and REP would have BTC, USD, and EURO trading pairs while MKR can be purchased using BTC and the USDC stablecoin. Tim Draper hints interest in Facebook’s new cryptocurrency project as major banking executives conclude their testimony on Capital Hill and Ripple makes an investment in an early-stage blockchain venture capital fund. According to reports, Facebook is actively seeking $1 billion from hedge funds, venture capitalists and other wealthy individuals to launch a stablecoin that will be pegged to the US dollar or a basket of currencies. The new stablecoin will allow users in India to transfer money on its WhatsApp messaging app. The move to target India for the coin’s debut is twofold. With a population of 1.339 billion, India is the largest remittance-receiving country in the world with $69 billion in annual payments. Second, it makes up the largest user base on WhatsApp, Facebook’s popular messaging app, with over 200+ million users. Bitcoin bull and billionaire venture capitalist Tim Draper is one of several potential investors who is expected to meet with the social media network to discuss an investment in the new crypto project. Draper was one of the first Silicon Valley players to investin Bitcoin and has invested in blockchain-related companies such as Bancor and the leading US cryptocurrency exchange Coinbase. Despite Facebook’s push to introduce a stablecoin, the social media giant is still battling broad issues related to privacy and fake news. The BBC calls WhatsApp the ‘black hole’ of fake news in India’s recent election, Facebook has also suffered a fresh major data breach, according to a report released last Wednesday by cybersecurity research firm UpGuard, exposing over 540 million records that reveal personal and private information and passwords. Leaders from big banks appeared on Capitol Hill on Wednesday to discuss the changes that have taken place in the banking industry since 2008. The chief executive officers of Citigroup, JP Morgan Chase, Morgan Stanley, Bank of America, State Street, Bank of New York Mellon and Goldman Sachs attended the hearing “Holding Megabanks Accountable: A Review of Global Systemically Important Banks 10 Years After the Financial Crisis” to testify before the US House of Representatives Financial Services Committee. The hearing covered a range of topics related to banking and the global economy, including blockchain technology and cryptocurrencies. Rep. Warren Davidson pointed out the transformative power of blockchain for traditional financial systems. Addressing Jamie Dimon, chairman and CEO of JPMorgan Chase, Davidson said he recalled a statement in 2017 when Dimon said he deemed cryptocurrencies as “not a real thing.” while announcing plans in 2019 to launch JPM Coin. which is being billed as the bank’s stablecoin, a type of cryptocurrency. Charles Scharf, chairman and CEO of the Bank of New York Mellon, relayed his tepid position on cryptocurrencies. Crypto investor Anthony Pompiiano, founder of Morgan Creek Digital, responded on Twitter by pointing out that the banks are backed by money laundering schemes that have amounted to billions in fines. Since Bitcoin’s creation 10 years ago, the banks run by these 7 men have been fined over $160 billion for various crimes and regulatory violations. Meanwhile, Ripple’s venture capital arm Xpring has backed Robot Ventures, an early-stage venture capital firm that invests in fintech and crypto companies. Other backers include Bain Capital Ventures and angel investors. Robot Ventures is providing capital, extensive whiteboarding and product strategy to founders who are focused on reinventing finance by utilizing blockchain technology and cryptocurrencies. Ripple’s Xpring has built a community of developers, entrepreneurs and partnerships to boost budding blockchain projects. Robot Ventures is reaching out to developers. The International Monetary Fund’s Managing Director, Christine Lagarde, has stated that there is indeed a lot of value in distributed technologies, telling CNBC that cryptocurrencies and digital assets are “shaking the system” and having an impact on the financial sector. I think the role of the disruptors and anything that is using distributed ledger technology, whether you call it crypto, assets, currencies, or whatever…that is clearly shaking the system. We don’t want innovation that would shake the system so much that we would lose the stability that is needed. Certainly, if cryptocurrency is to grow then certain measures will have to implemented to prevent consumers from being exposed to much risk, whether that be such incidents as that of QuadrigaCX, a hack like that of Cryptopia, or the volatility that market is still subject to. Lagarde’s recent positive comments on the space is in keeping with a list of established entities who have begun to see the advantages of decentralized technologies. The interest in the banking space, as far as cryptocurrencies and blockchain technology is concerned, has been growing rapidly in the past few years. In addition to JPMorgan Chase releasing its own token, JPM Coin, and IBM and Stellar working with banks to aid them in the release of stablecoins, the World Economic Forum (WEF) has also released a report that showed that over 40 central banks across the world are conducting extensive research and/or running pilot programs relating to the space, which an IMF report also concluded. Joseph Lubin: Ethereum Will Become The Global Settlement Layer – Not EOS, Not IBM’s Fabric, And Not R3’s Corda? Mitsubishi prides itself to be the largest financial group in Japan and upon the rollout will become the first Japanese bank to issue a virtual currency. Mitsubishi financial group has announced that they will be introducing ‘MUFG’ coin this year. The rollout was revealed by newly appointed president Kanetsugu Mike. The token has been under development since 2016 when it was initially conceptualized and has been developed in an effort to introduce the benefits of blockchain technology to payment methods. The MUFG coin is intended for retail purchases like making payments in a convenient store or a restaurant. It will also be transferable among users. Token users can download an app that will automatically convert the money in their accounts into the stable coin, they can then pay for goods and services or even transfer the token to other users. Mitsubishi prides itself to be the largest financial group in Japan and upon the rollout will become the first Japanese bank to issue a virtual currency. The stable coin is pegged to the Japanese yen on a 1:1 basis. With this technology, businesses can now access customers’ data without violating their privacy. Stable coins are a great invention in the cryptocurrency space and quite a number of them have been launched or plans for their launch are underway. MUFG being a Japanese bank on the way to introduce a stable coin further shows how positive Japan is towards embracing cryptocurrency.